Novel therapies based on a process known as RNA interference (RNAi) hold great promise for treating a variety of diseases by blocking specific genes in a patient’s cells. Many of the earliest RNAi treatments have focused on diseases of the liver, because RNA-carrying particles tend to accumulate in that organ. 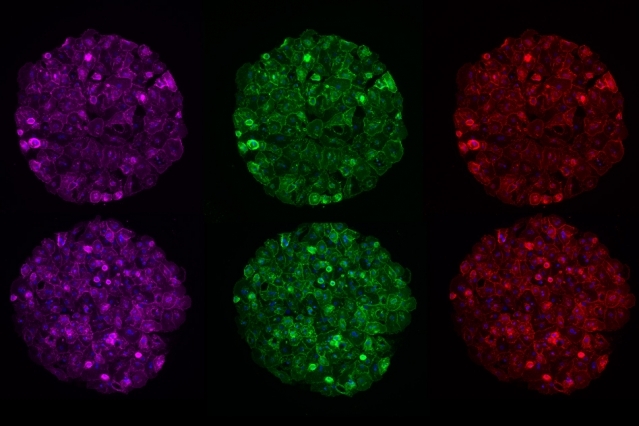 MIT researchers have now shown that an engineered model of human liver tissue can be used to investigate the effects of RNAi, helping to speed up the development of such treatments. In a paper appearing in the journal Cell Metabolism on March 5, the researchers showed with the model that they could use RNAi to turn off a gene that causes a rare hereditary disorder. And using RNA molecules that target a different gene expressed by human liver cells, they were able to reduce malaria infections in the model’s cells. “We showed that you could look at how this new class of nucleic acid therapies, especially RNAi, could affect rare genetic diseases and infectious diseases,” says Sangeeta Bhatia, the John and Dorothy Wilson Professor of Health Sciences and Technology and Electrical Engineering and Computer Science, a member of MIT’s Koch Institute for Integrative Cancer Research and Institute for Medical Engineering and Science, and the senior author of the study. The liver tissue model can also be used to manipulate metabolic enzyme levels, which could help researchers to predict how different patients would metabolize drugs, allowing them to identify possible side effects earlier in the drug development process. MIT research scientist Liliana Mancio-Silva is the lead author of the paper. Other authors include Heather Fleming, director of research for Bhatia’s lab; Alex Miller, an MIT graduate student; and Stuart Milstein, Abigail Liebow, Patrick Haslett, and Laura Sepp-Lorenzino of Alnylam Pharmaceuticals. Human liver tissue is notoriously difficult to grow outside of the human body, making it difficult to study how experimental drugs will affect the liver. Several years ago, Bhatia and her colleagues first demonstrated that they could grow human hepatocytes, the main type of liver cell, on special micropatterned surfaces, surrounded by supportive cells. This precision-engineered architecture creates a microenvironment in which human liver cells function much the same way as they do in humans. Since then, they have used this model to test small-molecule drugs for malaria and other diseases that affect the liver. In their new paper, they decided to try to demonstrate the model’s usefulness for testing the delivery of nucleic acids such as RNA. Through RNA interference, short strands of RNA can be used to block the expression of specific disease-causing genes. To explore RNA-based therapies, the researchers decided to model two different types of disease: genetic disorders and infectious diseases. As a model genetic disorder, the researchers chose alpha-1 antitrypsin-associated liver disease. This rare disease causes the alpha-1 antitrypsin protein to misfold and accumulate in hepatocytes, damaging them. They found that the RNA they delivered to the cells of the liver model could reduce expression of the implicated protein by about 95 percent. Dozens of other disorders of the liver could benefit from genetic manipulation, Bhatia says. The researchers also tested an RNAi treatment designed to treat infectious diseases by turning down genes expressed by the host, which the pathogen normally exploits to infect the host. In this case, they delivered RNA that interferes with a gene that encodes a cell surface receptor that the malaria parasite requires to get into liver cells and infect them. Other host genes could be targeted to treat infectious diseases such as hepatitis B. In some patient settings, Bhatia says, this kind of treatment could be preferable to having patients take daily pills over a long period of time, because a single shot of RNA has been shown to turn down gene expression for several weeks. The researchers also showed that this model could be useful for testing the possible side effects of traditional small-molecule drugs. The liver is responsible for metabolizing such drugs, and liver damage from these drugs is one of the biggest reasons that clinical trials fail. To make matters more complicated, different people can express varying levels of the metabolic enzymes used to break down drugs, so potential drugs need to be tested under different conditions. This is usually done in human liver tissue treated with drugs that inhibit certain metabolic enzymes. However, these drugs are not highly specific and can block multiple metabolic pathways at once. In this study, the researchers used RNA interference to reduce levels of two metabolic enzymes that belong to a family known as cytochromes P450. They were then able to test how the liver cells metabolized acetaminophen (Tylenol) and atorvastatin (Lipitor), which can damage the liver in some cases. They showed that the tissue model accurately replicated how these drugs are broken down when varying levels of metabolic enzymes are present. This kind of drug screening could make it easier for researchers to test the potential responses of many different types of people, using cells from just one donor, manipulated with RNAi, Bhatia says. In future studies, the researchers plan to study whether this model could be useful for studying gene therapy, which involves delivering DNA encoding a gene that is missing or defective. For example, hemophilia could be treated by delivering the gene for the clotting factor that hemophilia patients lack. The research was funded by the Bill and Melinda Gates Foundation, Alnylam Pharmaceuticals, and the Koch Institute Support (core) Grant from the National Cancer Institute.